At the dawn of World War II, Pablo Picasso brought all his plaster sculptures to his studio in Boisgeloup, near Paris, in order to protect them and eventually cast them into bronze. Since then, towards the end of the 1930s, the studio has remained intact but empty. Located about 60 kilometers northwest of Paris, close to Gisors in Normandy and not far from Auvers-sur-Oise, Giverny and Eragny, the Château de Boisgeloup is an estate, which Picasso purchased on June 10, 1930. As he fell in love with the beauty and peace of the surroundings, he decided to install his sculpture studio in Boisgeloup, where he regularly stayed with his wife Olga and their son Paul until 1937. According to traditional beliefs, the name Boisgeloup derives from bois-jaloux, which in this context implies a wood that is hidden away or screened as if by a jalousie, suggesting the secret nature of the place. The present château was built during the 18th century, following the burning down of the former one. It is situated in a park, which is surrounded by a stone wall. A high portal gives access to the property, with sculpted frames ornamenting its mounts and heavy doors in solid wood. The latter is overlooked by the property’s own church. There is an old dovecote at the rear of the servants’ quarters facing the château, a part of which Picasso took over as his sculpture studio. In this place of life and creation, Picasso received the frequent visit of illustrious friends from the artistic milieu of the period. He left Boisgeloup in 1937, whereas Olga stayed until the 1940s. Born in 1921, Olga y Khokhlova and Pablo Picasso’s only son, Paul, lived on the property until his passing in 1975. 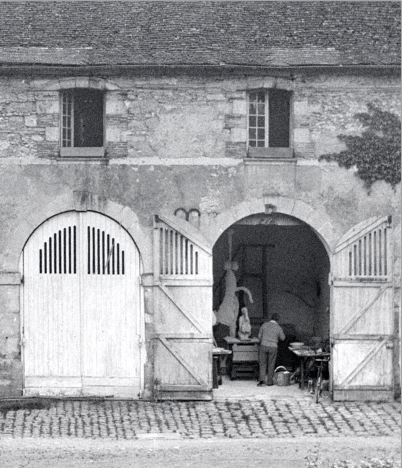 During the following decades, the sculpture studio served as a stockroom until Paul’s son, Bernard, and his wife Almine decided to breath life back into it in a contemporary way.